Who, other than brokers, will be participants? Financial institutions may become participants to manage the securities they hold. In addition banks, who offer domestic, regional and global custody services may also become participants. Contact CDBL for an up to date list of custody participants. Is it safe to hold my securities in CDBL? CDBL will not be permitted to operate until it has satisfied the Securities and Exchange Commission that it has implemented a system that is safe and secure. In addition the Commission has ongoing regulatory responsibility for CDBL. All messages between CDBL and the participants will be encrypted and CDBL will have a hot standby site so that all data is duplicated. The Law makes CDBL responsible for compensating investors if they suffer loss as a result of the negligent actions of CDBL staff or management. If I hold my shares in CDBL, can I vote at company meetings? Yes. The Law requires companies to treat account holders as members of the company for all purposes. If I hold my shares in CDBL, will I receive my dividends? Yes. The Law requires companies to treat account holders as members of the company for all purposes. In most cases you will receive your dividend from the company in the same way as you do today. However, the regulations permit companies to use facilities offered by CDBL to distribute dividends if they wish to do so. How do I open an account? 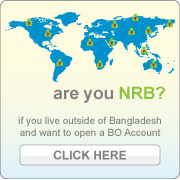 You will need to open an account through a participant unless you wish to open a Direct Account at CDBL. What will it cost me? This will depend on which participant you use. The amount the participant will charge you is not fixed by the Law or the Regulations. Can I rematerialise at any time? Yes – However, CDBL will charge your participant a fee for rematerialisation, which may be passed on to you. What happens if I die? Your securities will be transferred to your heirs or rematerialised in accordance with normal legal procedures. Can I open a joint account with another person? Yes – but you will need to agree with your participant whether both signatures or only one are required on any instructions affecting the account. Should I wait until I want to sell to dematerialise my securities? You may do this if you wish. However, in this case, you will need to wait until the issuer has confirmed that the securities have been dematerialised before the broker can enter the sell order into the market. This will take at least 48 Hours.